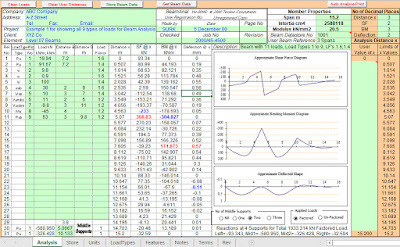 The program uses usual equations for Shear Force, Bending Moment and Deflection equations along the member span. When middle supports are specified, simultaneous equations are set up and solved to calculate the middle support reactions. The program internally works in consistent Force and Length Units. To help comprehend results, use of mixed units is allowed. Inertia and elastic modulus of the member section can therefore be defined in any units. Similarly, any desired units can be set deflection values. To specify units, go to the Units sheet and describe your own units of Force, Distance, Inertia, Modulus and Deflection. You need to calculate and specify conversion factors from consistent units to your chosen mixed units. 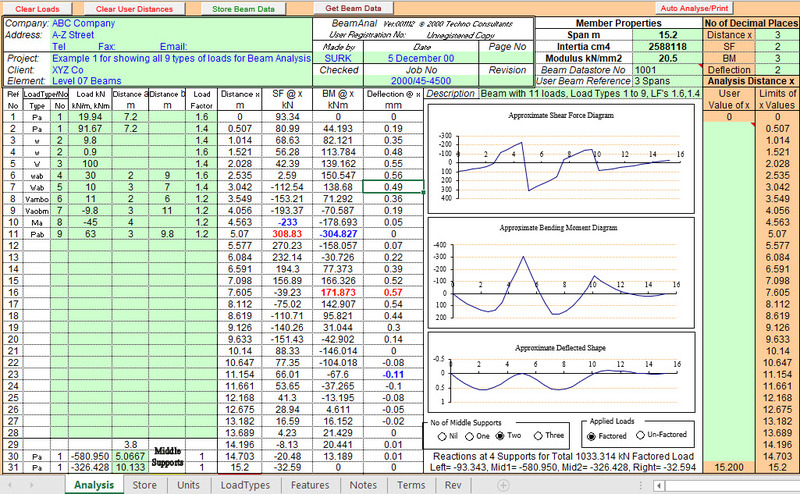 Sample values are given for your guidance in this sheet. The units cannot however be mixed in one project file. Chosen units apply to all beams in the file. This means that if units are changed in the middle of building up a data file, beam properties for all beams need to be re-defined to match the chosen units. Its Protected for Editing What is The Password of The SHeet? ?